Editor’s Note: More than 2.3 million people watched as Jeremy and Audrey Roloff shared their vows and committed their lives to each other. Now for the first time, the former co-stars of TLC’s hit show Little People, Big World share their imperfect, resilient, and inspiring love story in their new book A Love Letter Life. What follows is a taste of their story. Jeremy and I had talked about getting married after we both graduated, so I had been anticipating his proposal for about a year. I knew it was coming; I just wasn’t sure when. However, as Christmas, New Year’s, and Valentine’s Day passed, I started to wonder if he even had a ring or a plan to propose. It wasn’t unlike him to procrastinate, but I was getting a little anxious as the summer drew closer. I wanted to have enough time to find a dreamy dress and plan an epic celebration. I became the cliché girl anxiously waiting for “a ring by spring.” But Jeremy was not cliché, and he was not about to ask me to marry him on a holiday like all the other guys did. I should have known better. March 15 was perfect. When I returned to school after Jer’s beautiful proposal, I caught myself constantly glancing down at my sparkling ring and showing it off any chance I got. I was ecstatic to finally be a fiancée and thought I could put the anxiety of waiting behind me. But now instead of worrying about when he was going to propose, I was worrying about everything else—applying for jobs, finding wedding vendors, passing my finance class, competing in my last season of collegiate track and field, and preparing for graduation. We ended up having the most stressful engagement imaginable. Planning a wedding while living in different states was brutal. Plus, we were both trying to establish our career paths and decide where we wanted to live. I ended up accepting a corporate sales job in Los Angeles. I had been applying for jobs there, since that’s where most of Jeremy’s video and photo opportunities were. By the grace of God, I was able to delay my start date until the week after our wedding. Throughout the summer, we were searching for a place to live in LA, which is a daunting task all by itself, but especially so when neither of us lived there. Jeremy had to make the two-hour drive from Santa Barbara multiple times to meet with landlords in the hopes that we would be picked from the large number of applicants. I flew down once to search with him. If you’ve ever looked for a place to live in a big city, you know it’s worse than Black Friday shopping at the mall. On top of all this, Jeremy was taking a heavy load of classes and filming weddings on the weekends with his friend Tye. Other summer commitments included planning our honeymoon, participating in my best friend’s wedding, taking a group of high school Young Life girls to camp in Canada, buying our first car (which I needed for my new job), and my parents selling the house I grew up in (where I was temporarily living). I moved three times that summer. Oh, and did I mention that our entire engagement and wedding planning process was also being filmed for Little People, Big World? Looking back on it now, I can’t believe we got through it without damaging repercussions. It was a turbulent season, for sure, but we were committed to preparing for the promise—and that’s what kept us steadfast on the voyage. Despite our whirlwind of applying, searching, packing, and planning, we were adamant about prioritizing our future promise. We were committed to preparing more for our marriage than our wedding. We didn’t want all of our planning for the big day to defeat the purpose of the big day. That’s a temptation we considered low-hanging fruit for the enemy. We weren’t about to let Satan try to sabotage our future union. In the Bible, Satan is referred to as an accuser and our adversary. He wants to separate what God wants to join together. He is against marriage. He wants to create division, strife, and drama where God wants to instill unity, peace, and oneness. We were not immune to enemy attacks during our season of engagement. We experienced conflict with our parents, frustrations related to long distance, denials of housing applications, lost job opportunities, drama while filming the television show, and some hard and hurtful conversations with each other. However, we fought back against the onslaught of attacks on our future promise with an unrelenting confidence that the enemy would not be able to separate what the Lord was joining together. Taken from A Love Letter Life: Pursue Creatively, Date Intentionally, and Love Faithfully by Jeremy and Audrey Roloff. Click here to learn more about this title. 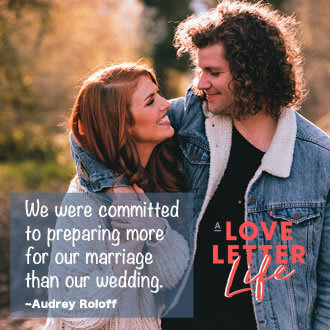 In A Love Letter Life, Jeremy and Audrey Roloff, stars of the TLC hit show Little People, Big World, share what they learned from their own dating journey in order to equip you to build godly relationships from your first date to saying ‘I do’ and beyond. As Jeremy and Audrey write, if you can fall into love, you can fall out. True love is something you choose to live out each day through your actions, decisions, and sacrifices. To find and still seek, now that is love. From the moment you meet your potential spouse, you can be intentional about shaping a beautiful love story, uniquely written for who God created you both to be. Whether you’re single and searching, in a serious dating relationship, or desiring to love your spouse better, Jeremy and Audrey equip you to pursue an intentional, creative, and faithful love story by sharing theirs. 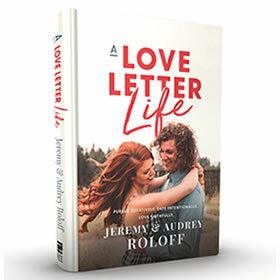 Told through both Jeremy’s and Audrey’s voices, A Love Letter Life tells a passionate and persevering story of relatable struggles, hard-learned lessons, practical tips, and devout commitment. In these pages, they encourage you to stop settling for convenient relationships, offer perspective on male and female differences in dating, tackle tough topics like purity, give their nine rules for fighting well, suggest fun ideas for connection in a world of technology, and provide fresh advice on how to intentionally pursue a love story that never ends. Learn more at ALoveLetterLife.com. 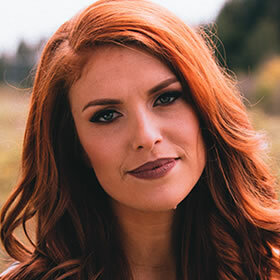 Audrey Roloff is a fiery redhead from Portland, Oregon, where her parents taught her to ski before she could walk and raised her to know and love Jesus. She was the captain of the Oregon State Cross Country and Track team in college where she earned a degree in marketing and entrepreneurship. Audrey shares life, faith, and motherhood on her blog at aujpoj.com. She is passionate about motivating women to always believe in the more that is within them, and she spreads this mission through her devotionals and clothing line. She is also the cofounder of Beating50Percent.com, a marriage ministry, with her husband Jeremy. She’s an 8 on the enneagram, drinks her coffee beige, and loves all things floral. The post Preparing for the Promise appeared first on Bible Gateway Blog.